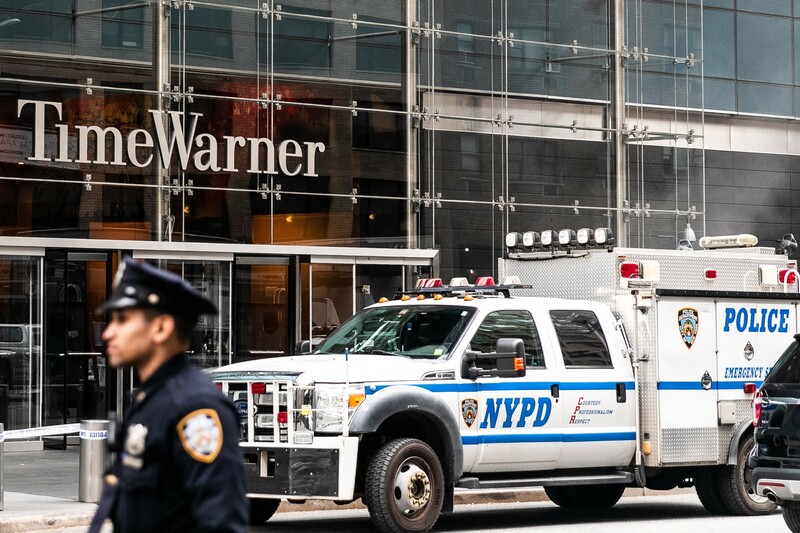 Police outside the Time Warner Center in New York after the discovery of an explosive device at the CNN offices, Oct. 24, 2018. Explosive devices were sent to former President Barack Obama and former Secretary of State Hillary Clinton, as well as to CNN’s offices in New York, sparking an intense investigation on Wednesday into whether a bomber is going after targets that have often been the subject of right-wing ire. WASHINGTON — In moments of national crisis, presidents typically reach for unifying themes, as Bill Clinton did after the Oklahoma City bombing and George W. Bush did with the bullhorn on the wrecked fire truck after 9/11. President Donald Trump on Thursday chose confrontation rather than conciliation. Rather than trying to pull together an angry, anxious country during a wave of apparent pipe bombs sent to some of the president’s most prominent critics, Trump lashed out, blaming perceived enemies for the toxic political environment that opponents say he himself has encouraged. Never a unifier by nature, Trump followed his instinct for pushing back, abandoning the brief and scripted call for national unity issued the day before. Trump’s posture as a leader working to bring the country together — saying on Wednesday that any attempted terrorist act “against any American is an attack on every American” — was short-lived and to many critics unpersuasive. Sen. Chris Murphy, D-Conn., pointed to the president’s tweet on Thursday morning as motivation for Democrats to vote in the coming midterm elections. The White House press secretary, Sarah Huckabee Sanders, defended her boss Thursday in remarks to Fox News. “The president, I think, could not have been more presidential yesterday when he spoke,” she said. The debate that immediately emerged after the discovery of the pipe bombs Wednesday and Thursday did not lend itself to common national purpose. Republicans and Democrats were quick to blame each other. Some prominent conservative commentators and defenders of Trump speculated that the Democrats were behind the bombs, asserting that unnamed liberals sent the packages as part of a plot to make Republicans look bad.